"The United States of America is indeed the land of Mary Immaculate." The United States Bishops, in the year 1846, chose the Blessed Virgin Mary under her title of the Immaculate Conception as the patroness of the United States of America. 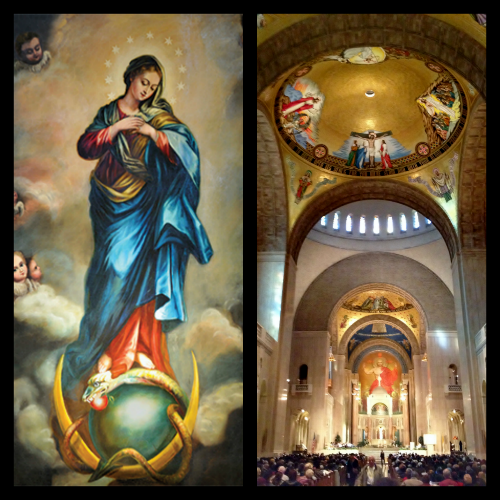 This is why we have the Basilica of the National Shrine of the Immaculate Conception in Washington, D.C.
"With enthusiastic acclaim and with unanimous approval and consent, the Fathers [of the Baltimore Council] have chosen the Blessed Virgin Mary, conceived without sin, as the Patroness of the United States of America." The choice of Our Lady in her Immaculate Conception as Patroness of the United States was approved by Pope Pius IX on Feb. 7, 1847. What is interesting is that the American Bishops chose this title of Mary as the patroness of the United States, requesting special permission from the Holy Father to do so, before the Immaculate Conception of the Blessed Virgin Mary became infallible dogma for the universal Church. In fact, this request of the U.S. bishops to the Holy See to promote or claim this title of Our Lady may have been a significant contributing factor to the later declaration of the dogma. On Dec. 8, 1854, eight years after the American bishops chose Mary Immaculate as their patroness, Pope Pius IX solemnly declared the Immaculate Conception of the Blessed Virgin Mary to be an article of faith in his Apostolic Constitution Ineffabilis Deus. Even more interestingly, the flagship of Christopher Columbus' expedition to the New World, the Santa Maria, had a full name of Santa Maria de la Inmaculada Concepcion (Holy Mary of the Immaculate Conception). The other ships, the Niña (little girl) and the Pinta (painted one) foreshadows Our Lady of Guadalupe, the first Marian apparition in the New World which would occur two centuries later. The day that Columbus claimed the Americas for the Spanish crown, October 12, 1492 (Columbus Day), was a major Marian feast day in Spain---Our Lady of the Pillar. This title of Our Lady corresponds to the first-ever Marian apparition, which took place in Spain in 40 A.D., as well as the first-ever church dedicated to Our Lady. Read more about Christopher Columbus and the First Marian Apparition in Church History: Our Lady of the Pillar. 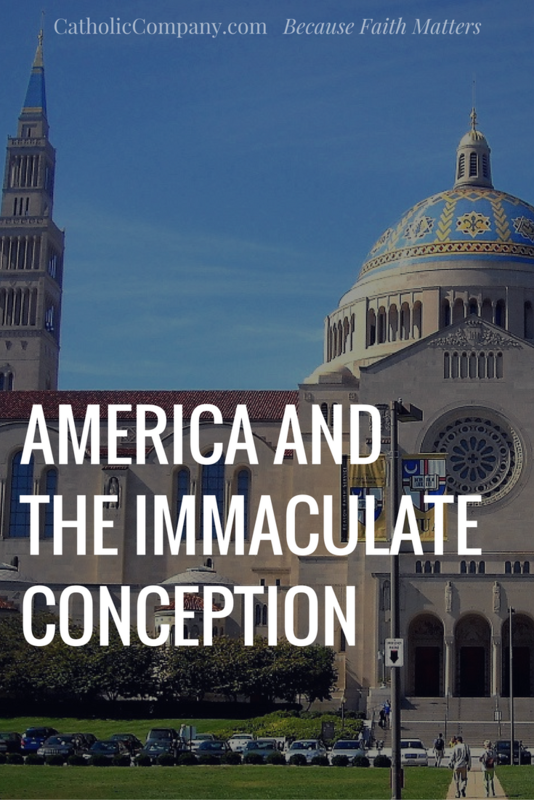 You can also read the full historical account of how America became the "Land of Mary Immaculate" and the role of our U.S. bishops in the declaration of this Marian dogma here. 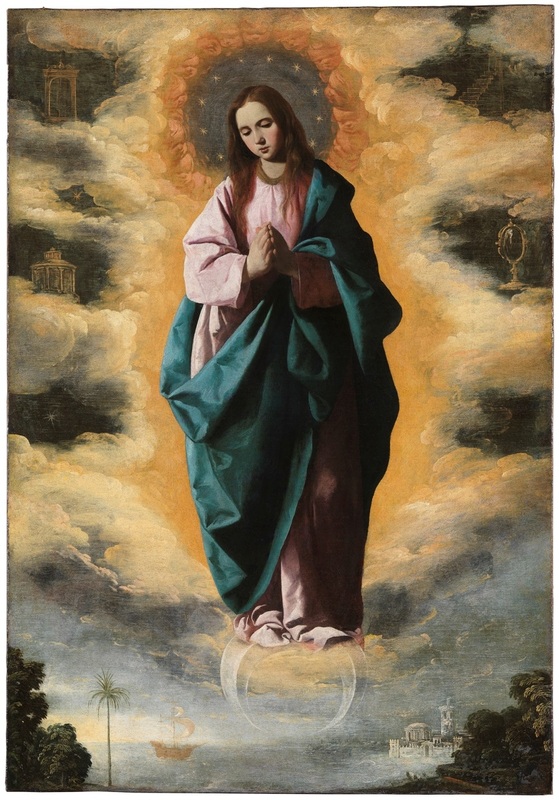 The first American church dedicated to the Immaculate Conception was in St. Augustine, Florida, in 1584. In 1644 Pope Innocent X declared the feast of the Conception of Mary to be a holy day of obligation in Spanish territories, which included those in the Americas. The portion of the American frontier called "Our Spanish Borderlands" (Florida, Georgia, Texas, New Mexico, Arizona, and California) was placed under the patronage of Mary Immaculate in 1760 by Pope Clement XIII. Bishop Carroll, the first American bishop, chose the Virgin Mary as the patroness of America's first diocese---Baltimore---in 1791. The United States of America has undoubtedly been placed into the hands and heart of Mary Immaculate from its very foundation, and it is to her that we should turn for all our nation's needs. The December 8th feast of the Immaculate Conception is the rank of a Solemnity and a Holy Day of Obligation for American Catholics. Our soul overflows with joy and our tongue with exultation. We give, and we shall continue to give, the humblest and deepest thanks to Jesus Christ, our Lord, because through his singular grace he has granted to us, unworthy though we be, to decree and offer this honor and glory and praise to his most holy Mother. All our hope do we repose in the most Blessed Virgin -- in the all fair and immaculate one who has crushed the poisonous head of the most cruel serpent and brought salvation to the world: in her who is the glory of the prophets and apostles, the honor of the martyrs, the crown and joy of all the saints; in her who is the safest refuge and the most trustworthy helper of all who are in danger; in her who, with her only-begotten Son, is the most powerful Mediatrix and Conciliatrix in the whole world; in her who is the most excellent glory, ornament, and impregnable stronghold of the holy Church; in her who has destroyed all heresies and snatched the faithful people and nations from all kinds of direst calamities; in her do we hope who has delivered us from so many threatening dangers. We have, therefore, a very certain hope and complete confidence that the most Blessed Virgin will ensure by her most powerful patronage that all difficulties be removed and all errors dissipated, so that our Holy Mother the Catholic Church may flourish daily more and more throughout all the nations and countries, and may reign "from sea to sea and from the river to the ends of the earth," and may enjoy genuine peace, tranquility and liberty. We are firm in our confidence that she will obtain pardon for the sinner, health for the sick, strength of heart for the weak, consolation for the afflicted, help for those in danger; that she will remove spiritual blindness from all who are in error, so that they may return to the path of truth and justice, and that here may be one flock and one shepherd. Let all the children of the Catholic Church, who are so very dear to us, hear these words of ours. With a still more ardent zeal for piety, religion and love, let them continue to venerate, invoke and pray to the most Blessed Virgin Mary, Mother of God, conceived without original sin. Let them fly with utter confidence to this most sweet Mother of mercy and grace in all dangers, difficulties, needs, doubts and fears. Under her guidance, under her patronage, under her kindness and protection, nothing is to be feared; nothing is hopeless. Because, while bearing toward us a truly motherly affection and having in her care the work of our salvation, she is solicitous about the whole human race. And since she has been appointed by God to be the Queen of heaven and earth, and is exalted above all the choirs of angels and saints, and even stands at the right hand of her only-begotten Son, Jesus Christ our Lord, she presents our petitions in a most efficacious manner. What she asks, she obtains. Her pleas can never be unheard. This article has been updated and was originally published in December 2013. © The Catholic Company. All rights reserved. One of my earliest memories is my grandfather introducing me by my middle name Marion. He would explain to people that I was born on the last day of the Marian year December 8th, 1954. It took many years, but I finally knew and felt why that was special. Thus, the reason why I have faithfully worn my Immaculate Conception medal around my neck for many years, never removing it except for medical reasons. I pray to Her every day thanking Her for Her "help and protection."